Smoke alarms are a key part of a home fire prevention plan. When there’s a fire, smoke spreads throughout a structure very quickly but a working smoke alarm can give you and your family enough warning to allow everyone to escape to safety. Smoke alarms should be installed inside and outside each bedroom and sleeping area, on each level of the home, and in areas such as kitchens and laundry rooms. More than 60% of all fire deaths occur in homes without operable smoke detectors. 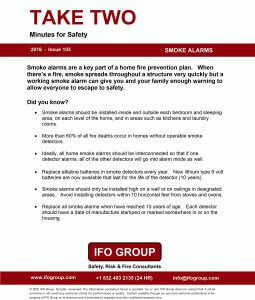 Ideally, all home smoke alarms should be interconnected so that if one detector alarms, all of the other detectors will go into alarm mode as well. Replace alkaline batteries in smoke detectors every year. New lithium type 9 volt batteries are now available that last for the life of the detector (10 years). Smoke alarms should only be installed high on a wall or on ceilings in designated areas. Avoid installing detectors within 10 horizontal feet from stoves and ovens. Replace all smoke alarms when have reached 10 years of age. Each detector should have a date of manufacture stamped or marked somewhere in or on the housing.